Looking at fingernails can help you understand people better. Whether you are dealing with a cashier at the grocery store, a client returning an item, a tourist traveling with you, or even your child or your partner on a daily basis, knowing how each type of fingernails behaves will go a long way in improving your interactions. When you look at fingernails, only consider the part that is actually covering the skin, not the part that has grown beyond. If the fingernails you are looking at don’t fall in one of those categories, don’t try to analyze them. To learn about white spots on different fingernails, click here. 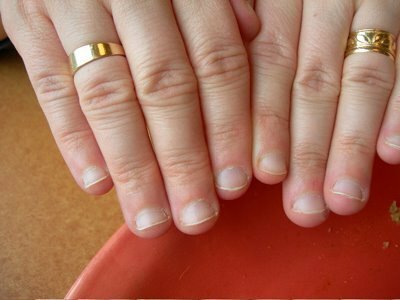 If you are interested in uncovering health problems by looking at fingernails, read this article. The fingernails reveal how healthy the nervous system is. They protect the nerve endings and reflect the ability to cope with stress. The larger the nail, the more protected you are from outside influences, and the opposite is also true. 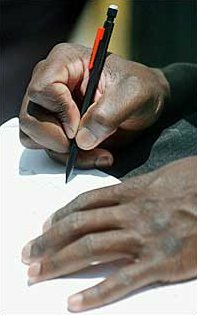 Those fingernails are as wide as they are long and cover well the extremities of the fingers. They offer an excellent shield for the nervous system. Usually, these people are able to stay peaceful most of the times, even in trying situations. They may also have a calming effect due to their excellent nervous system. In times of crisis, this is the type of people you want in your team, in your class, or in your company. My partner has large fingernails. I always recognize the usefulness of this feature when we travel. Whether our plane is delayed, the weather is worse than expected, or we have to change our plans at the last minute, he is always serene and willing to adapt. It is always pleasant to be around someone with a healthy attitude. They are likely not to get angry or upset, which is relatively rare. However, if you push them too far, they will react like anyone else! If the person has long and narrow fingernails, there is a chance they are also covered with nail polish or plastic nails – or at least perfectly manicured - and that the person is dressed very elegantly. People with long and narrow fingernails love beauty and order. If someone undoes what they have organized, they can easily get upset. One day, I was traveling with a small group and the driver had packed our suitcases tightly and efficiently in the trunk. I suddenly realized that I had forgotten to take out my passport from my suitcase, and asked the driver if I could get it. Full of rage, he started to remove each suitcase and throw it on the ground. I quickly reached for my passport and put the suitcases back. Within a few seconds, the driver’s anger had disappeared. His beautiful suitcase arrangement was back to normal, so he was happy! I had noticed his long and narrow fingernails and immediately knew where the problem came from. Making sure everything was in order was the best way to satisfy him. Since beauty and order are extremely important to them, the worst thing you can do to them is mess up their hair or clothes or disturb something they have spent time preparing. However, compliments on their clothes, organization skills or home will be very well received. 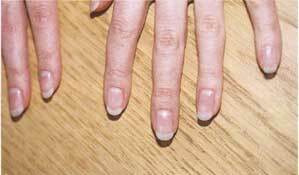 Short or small nails – compared to the size of the finger - are not efficiently protecting the nervous endings of the fingers. Therefore, these people will be more vulnerable to external influences and are likely to lose their temper if something doesn’t go the way they want. As you can see on the illustration, many small fingernails are only small because they are bitten, and the protection of the nervous system is being destroyed. I once asked a bank cashier for a transaction she wasn’t familiar with. Having tiny fingernails, she became very agitated and was starting to be impolite. Fortunately, her supervisor showed up and took care of the transaction, and the cashier could rest. Everything will be okay until the person feels there is something he/she can’t control, no matter how trivial. In this case, you may have to pretend you are talking to a small child and make the person feel like everything is okay. 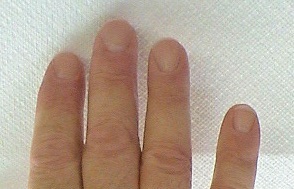 People with small or short fingernails tend to be analytical and perfectionist. Remember to stay cool, especially if your own fingernails are also small! Flared nails are fan-shaped, narrow at the base and wide at the top. They have the same desire to share and accomplish as the broad fingernails, but the narrow base lacks the nervous resistance to carry out their actions peacefully. Their analytical nature allows them to excel in research and detailed work, but they may be prone to impatience, defensiveness and anxiety. They also tend to be overcritical. 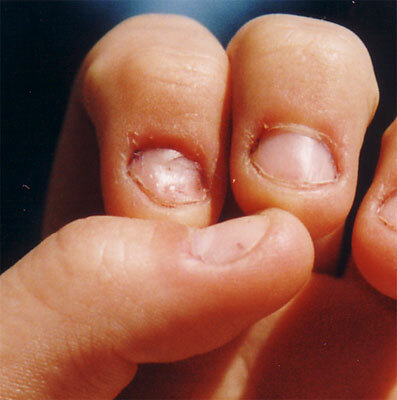 I spent several years living with someone having this type of fingernails. While he could spend hours building models, he had very little patience with people. One minute, he would be very pleasant, and the next minute he could become extremely anxious. When things are going well, enjoy their personality. In stressful times, make sure they can turn to some detailed activity that will appease them. Of course, fingernails won’t tell everything about someone’s personality, but having an idea of how much stress a person can take is bound to be very useful in all types of relationships.